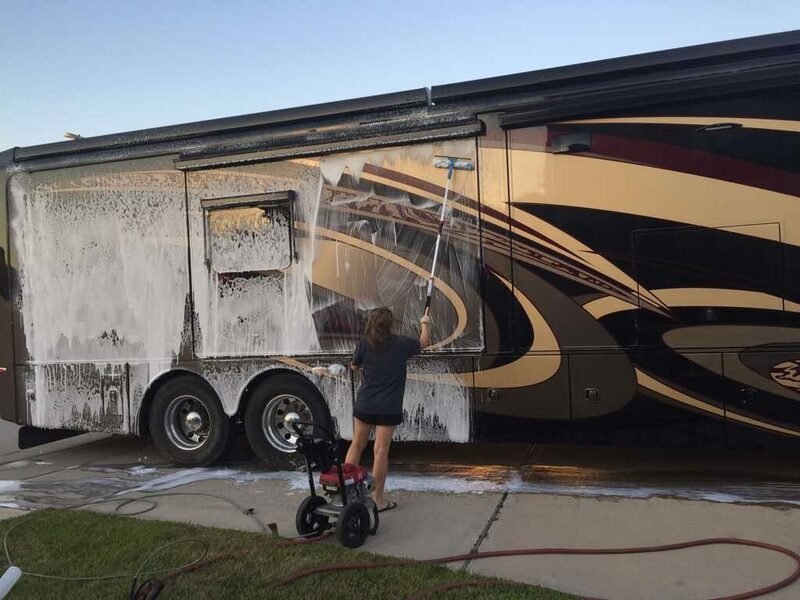 Whether your RV has been in storage since winter or you live on the road full-time, doing some annual spring cleaning will keep your RV dirt-free and looking as good as new. These supplies are great to have on hand while you’re sanitizing and polishing your rig. First and foremost you’re going to want a quality all-purpose cleaner. We love this Super Cleaner by Car Guys; you can use it on a wide range of fabrics such as carpet, leather, vinyl, plastic, and rubber. You can use Car Guys Super Cleaner on almost anything. Photos via Amazon. 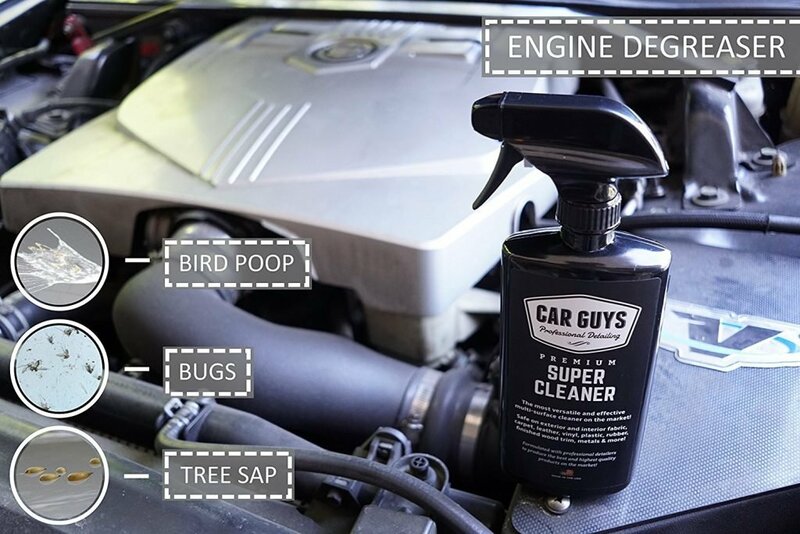 It can also clean bird droppings, bugs, and tree sap off your vehicle, and be used to wipe down your seats, dashboard, door panels, and steering wheel. The 18-ounce spray bottle is about $17 on Amazon and comes with a cleaning towel. Another great option is Mrs. Meyer’s Multipurpose Cleaner. It’s biodegradable and made with 98% naturally derived ingredients like essential oils. To wash all the dirt, bugs, and grime off your RV’s exterior, invest in a biodegradable RV wash like this one from StarBrite. It’s non-toxic and safe to use on all exterior surfaces without fading the decals. The highly concentrated soap can easily be mixed with water to produce suds for scrubbing and rinses well with a fresh scent. Microfiber is the best material for cleaning your exterior because it’s extra soft, absorbent, and doesn’t scratch the surface. You can find both microfiber towels and cleaning mitts that help scrub dirt and grime without messing up your vehicle’s paint. This Microfiber Mitt won’t scratch your RV’s exterior. Simply drop the mitt in your bucket of soapy water and wear it to scrub your vehicle, or you can take the mitt off and use it like a sponge. The large mitts measure 12’’ long by 8’’ wide and are machine washable. You can get them on Amazon for about $7. If you have a big rig, you may want a long wash brush like this one from Camco to scrub the dirt off hard-to-reach spots. It extends from 47″ up to 72″ long and has a built-in on/off button to adjust the water flow while you’re washing. Keeping the RV as good as new. Photo by iRV2 member UncleJamie. Waxing your RV’s exterior can not only give it a good shine but also protect it from damaging UV rays. Our favorite type is this Butter Wet Wax by Chemical Guys. The carnauba-based wax got its name “Butter Wet Wax” because it can easily be applied and wiped off as easy as butter. It makes the colors on your vehicle pop out and also helps with water spots, bird droppings, and road tar. 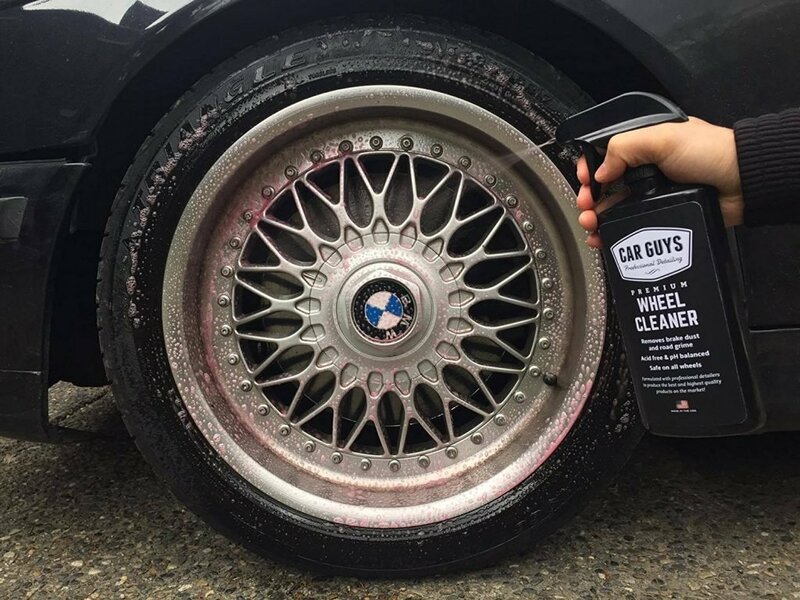 A wheel cleaner like this spray from Car Guys will keep your tires in good condition. It can be used on all types of wheels and clean away brake dust, grime, and corrosive salt from the winter roads. Just spray down your tires, use a small brush to scrub, and rinse. Wheel cleaner can wash off all the corrosive salt from winter roads. Holding tank treatment will keep your black and gray tanks flowing smoothly and odor free. You can easily drop in one of Camco’s Orange Citrus Scented Drop-Ins (similar to laundry detergent pods) to help break down waste and get rid of smells. Each drop-in is ultra concentrated and can be used to clean up to a 40-gallon tank. The drop-ins are non-formaldehyde and can be used in any septic tank, as well as portable camping toilets. A quality glass cleaner will keep your windows and windshield crystal clear. Invisible Glass Cleaner works well on regular or tinted windows and leaves no streaks or residue. Long-handled cleaners will keep you from having to awkwardly reach when cleaning your windshield. This Reach and Clean Tool from Stoner has a long, pivoting triangular head that’s ideal for getting spots that are hard to reach by hand. It also comes with reusable microfiber cleaning bonnets that you can machine wash. Fabric cleaners have many uses around the RV: they can freshen up your seats, upholstery, curtains, awning, and fabric convertible tops. This Fabric Guard can be used on any type of fabric and helps protect against stains. Why do you suggest only the expensive brands? There are many others that are just as good as those you mentioned. 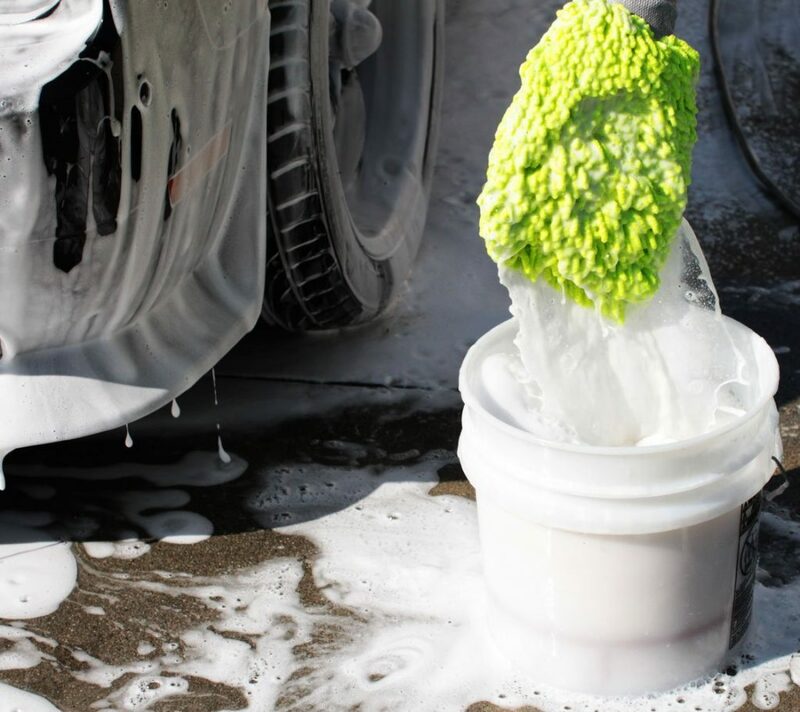 Regular automobile car wash is just as good as any and is cheap. A $7 can of Mothers paste wax is as well. A trip to Walmart is all it takes to find everything needed and at at affordable prices. All the fancy names are just that in my opinion. missed a roof cleaner. Dawn dish detergent works well on most roofing surfaces.